Simon & Schuster/Paula Wiseman Books, 9781481453134, 40pp. There is a wall in Ángel’s neighborhood. Around it, the community bustles with life: music, dancing, laughing. Not the wall. It is bleak. One boy decides to change that. But he can’t do it alone. 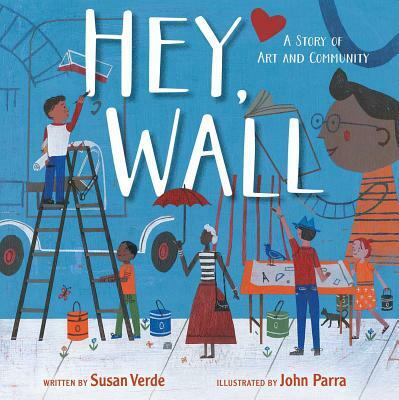 Told in elegant verse by Susan Verde and vibrantly illustrated by John Parra, this inspiring picture book celebrates the power of art to tell a story and bring a community together. Susan Verde’s first picture book, The Museum, illustrated by Peter H. Reynolds, was a Bank Street Best Book of the Year. Booklist praised, “The rhymed text captures the excitement of a being sparked by art.” Her other books include You and Me, I Am Yoga, The Water Princess, and I Am Peace, all illustrated by Peter H. Reynolds; as well as Rock ’n’ Roll Soul, illustrated by Caldecott Medalist Matthew Cordell; My Kicks, illustrated by Katie Kath; and Hey, Wall, illustrated by John Parra. Susan is a former elementary school teacher with a Master’s degree in reading remediation. In addition to writing books, Susan teaches yoga and mindfulness to kids (and adults) of all ages. She lives in East Hampton, New York, with her three children. Learn more at SusanVerde.com. John Parra’s illustrations for Frida Kahlo and Her Animalitos, written by Monica Brown, earned the book a New York Times Best Illustrated Book designation. He also illustrated Green Is a Chile Pepper: A Book of Colors by Roseanne Thong, which received a Pura Belpré Honor and the Américas Book Award: Commended; Marvelous Cornelius: Hurricane Katrina and the Spirit of New Orleans by Phil Bildner, which won the Golden Kite Award for Picture Book Illustration and was a Bank Street Best Book of the year; and Hey, Wall, by Susan Verde, which School Library Journal called “a must-purchase” in a starred review. Learn more at JohnParraArt.com. The wall of the title belongs to a city building, its expanse broken only by a straggling vine, some graffiti, and a torn poster for some long-ago event. A boy addresses it: “Maybe once you were full of style,/ but no one has taken care of you./ You are nothing to look at.” In textural, mural-like paintings by Parra (Frida Kahlo and Her Animalitos), friendly-looking, folk-art-style children play on matte pages. Though the landscape is bleak (“We cheer for the tiny flowers pushing through the cracks in the sidewalk”), the neighborhood’s families—of all colors—eat, dance, and laugh together (“there is love; there is joy”). The boy realizes that if something is to be done about the wall’s uncared-for expanse, it’s up to him: “I’ve got my pencil,/ I’ve got my paints,/ I’ve got my dreams.” The boy organizes his neighbors, and with paint, ladders, and smiles, they create a beautiful mural. This story of urban renewal sends a welcome double message by Verde (The Water Princess): neighbors and neighborhoods are more than the way they look, and ordinary people can band together to transform big things. Verde’s unique style and simple yet increasingly important messages of peace, mindfulness, and community make her stories a must-share! This title is no different. Turning the first page, readers see the big wall referenced in the title, but also the bustling city street and sidewalks, and a boy—pondering the surface and wondering how he can make this empty wall something special that represents his life and his community. The boy walks children through the seasons, and they see that the wall is unchanged and unadorned as the city lives and breathes around it. The boy decides to take matters into his own hands, and with the power of art and community, he breathes life back into the wall, so it pulses and dances just like the people and neighbors it now represents. The final page shows the transformation and the simple words, Hey, Wall! Both the author and illustrator notes are instrumental in sharing this picture book as a read-aloud with students and will spark the necessary conversation of change and community, and how art can support both. ­VERDICT A must-purchase for elementary libraries that could easily support art curriculums covering topics of graffiti, street art, and using art to spark social change.